We had a spell of unbearably warm weather the last couple of months here in sunny Colombo. It’s just this week that the dry spell has been broken with rain showers. Cooling salads became a regular part of our meals during the last several weeks so I felt like sharing a salad post this week. A simple, colourful and cooling salad. Lightly fry the chopped onion and chillies in a frying pan. Add the grated coconut and gotu kola leaves to the pan and stir fry for 2 – 3 mins. Transfer the contents of the pan to a food processor and process it. Add the juice of half a lime and salt, to taste, to the ground gotukola mix. Clean and grate the carrot and beetroot separately. 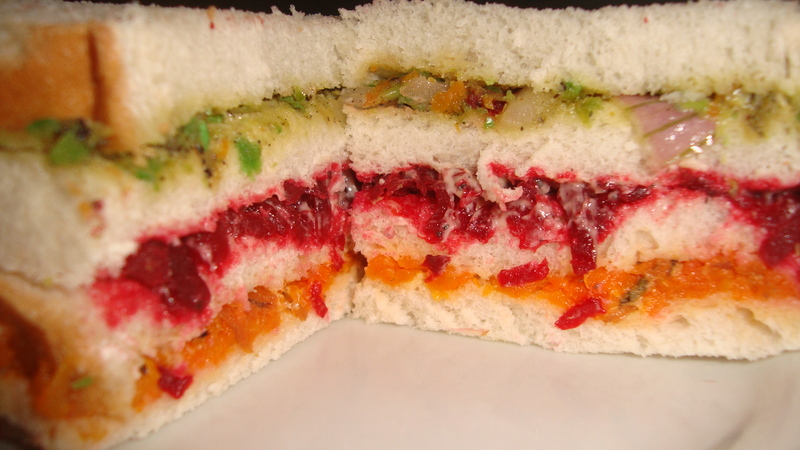 Divide the juice of the remaining half of the lime between the grated carrot and beetroot. Add salt and pepper to taste. Arrange the salad on a plate with the green gotu kola mix in the center surrounded by the grated carrot and beetroot. Add the sliced cucumber and tomato to the salad plate. Enjoy the cooling salad on its own or with a little rice. Roti with sambal has always been one of my comfort foods. Today’s recipe is one of my mother’s new versions of vegetable roti – this time, with beetroot. Heat the grated beetroot with ¼ cup of water and a pinch of salt in a saucepan. Cook the beetroot till the water dries up. After the cooked beetroot has cooled, add the flour, chopped onion, chillies, scraped coconut, salt and oil to the grated beetroot. Mix well and stir in water to make the roti dough. Divide the roti dough into 4 balls. Let the balls of dough rest for about 15 mins before rolling out the dough balls to make a flattened roti disk. Cook each of the roti on a griddle, with 3-4 mins on each side. Serve the beetroot roti with red chilli sambal. 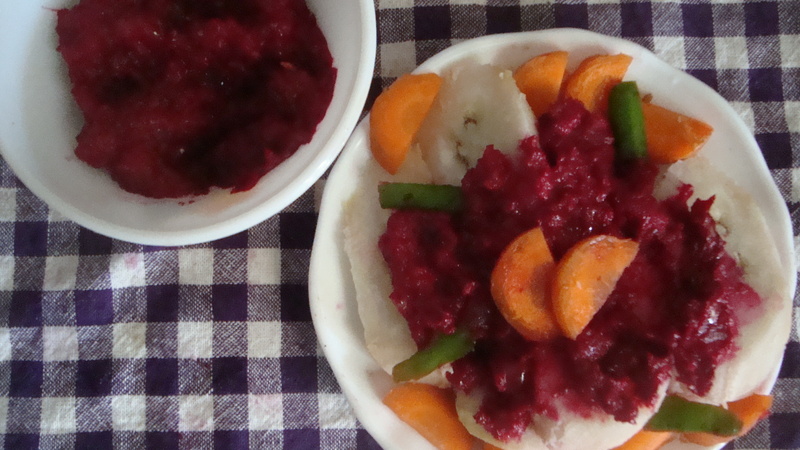 Today’s recipe is that of a quick to prepare and delicious beetroot dish. Mix ½ tsp salt with 1 cup of grated beetroot and keep aside. Heat 2 tbsp sesame oil in a pan and fry the fennel seeds, chopped onion, green chillies and curry leaves for a minute. Add the grated beetroot to the pan and stir-fry for 5 – 10 mins over low heat. Add 1 tbsp coconut and ½ tsp pepper to the beetroot mix and cook for another 2 mins. 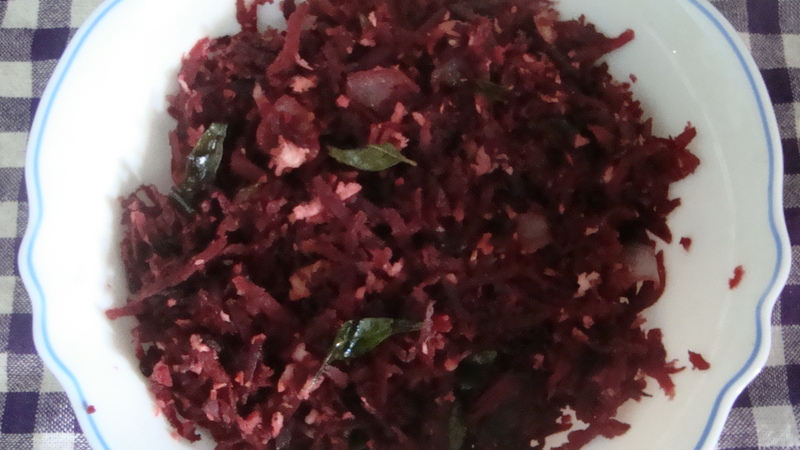 Serve the beetroot varai with rice. 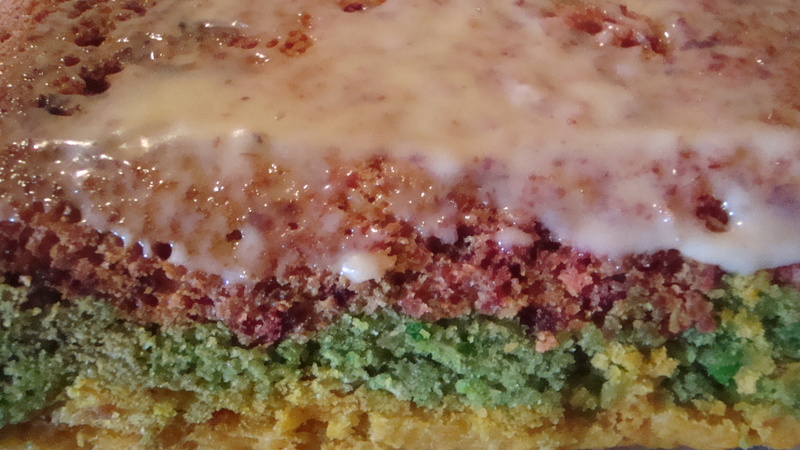 Today, I will share one of my mother’s latest cake experiments. She got very much caught in her fruit cake series that she wanted to bake this triple layer cake. I call it the cake extravaganza and it very much reminded me of Tian-Tian’s birthday cake with the many ingredients put into it and the time taken. 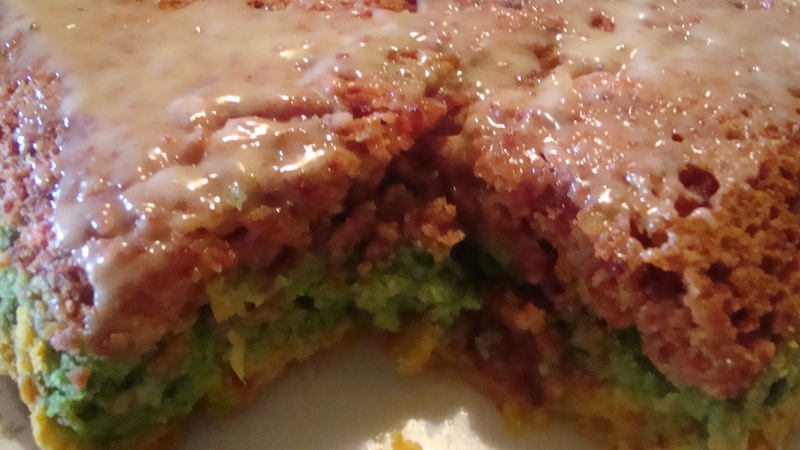 It did taste good, though personally I would have preferred each of the three layers as a separate cake. Steam the beetroot and carrot for about 10 mins. 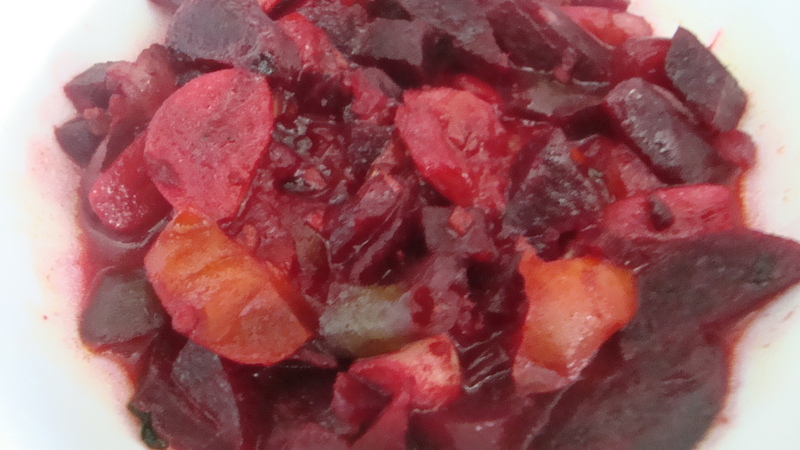 Separately blend the steamed beetroot and carrot in a processor. Next, finely chop up the apple and guava. Grind a few mint leaves. Cream ¼ cup margarine and ¼ cup sugar each in three mixing bowls. 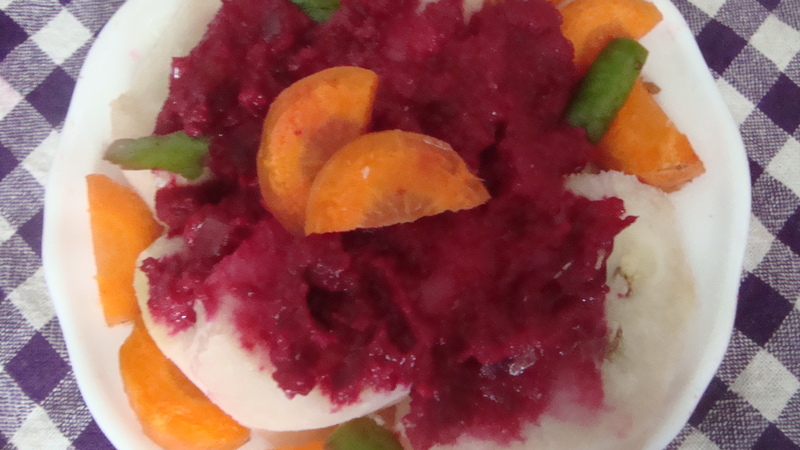 To the first bowl, add the pureed beetroot to the mix and to the third bowl, add the pureed carrot to the mix. To the second bowl, add the finely chopped apple and guava together with the ground mint leaves. Add ¼ cup of oats and 1 tbsp of mashed banana to each of the three bowls and mix well. Stir in the lime juice (2 tbsp each for the first and third bowl and 1 tbsp for the second bowl) and 1 tsp vanilla essence each, together with ¼ cup of water, to each of the three bowls and beat the respective mixture well. Divide the flour into three ½ cup flour piles. Sift each with ¼ tsp baking soda and ½ tsp baking powder. Add a sifted ½ cup flour mix to the mixture in each of the three bowls. Whisk the cake batter until smooth. Transfer the beetroot cake batter to the baking tray and spread the batter evenly. Then, transfer the apple, guava and mint cake batter to the baking tray and spread the batter evenly over the beetroot mix to form the middle layer. Transfer the carrot cake batter on top of the apple batter and spread it evenly. Bake the cake at 170⁰C/ 338⁰F and bake for 45 mins – 1 hour. Whisk together 4 tbsp icing sugar, 1 tbsp vegetable margarine and 1 tsp lime to make a light icing and spread it thinly over the cake, after it has cooled. Slice the cake into 15 or 20 pieces and serve with a cup of plain or fruit tea. 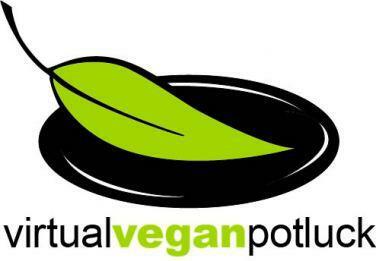 Today is the Virtual Vegan Potluck! I had come across this post recently, and as one who generally enjoys potlucks, decided to join a virtual one after a quick chat with my mother who has contributed more than 90% of the recipes on this blog to-date. So today’s recipe is an ash plantain and carrot with beetroot sauce recipe that my mother concocted, given that I had mentioned beets was the featured ingredient. Wash the three vegetables, without peeling them. Boil the ash plantain and beetroot for about 15 mins. After boiling, peel the ash plantain and beetroot separately. If you prefer the carrot to be boiled or steamed, you will need to do so separately. Else, simply peel the cleaned, fresh carrot and slice thinly and arrange in a serving dish. Slice the boiled and peeled ash plantain and layer the slices around the carrot in the serving dish. Sprinkle with salt. Peel the beetroot and chop it up. Heat a tsp oil and fry the chopped ginger, garlic, chilli and onion lightly. Transfer the lightly fried ingredients to the blender together with the chopped beetroot and salt, to taste, and blend to a puree/ sauce. Stir in a tbsp of sesame oil after blending. Pour the sauce over the dish with the ash plantain and carrot slices. Garnish with thin slices of chilli and serve. For accessing the other blogs participating in the Virtual Vegan Potluck, press the ‘go back’ or ‘go forward’ buttons below. The recipe of my mother’s that I am sharing today is a fusion of the south and north Sri Lankan cooking. 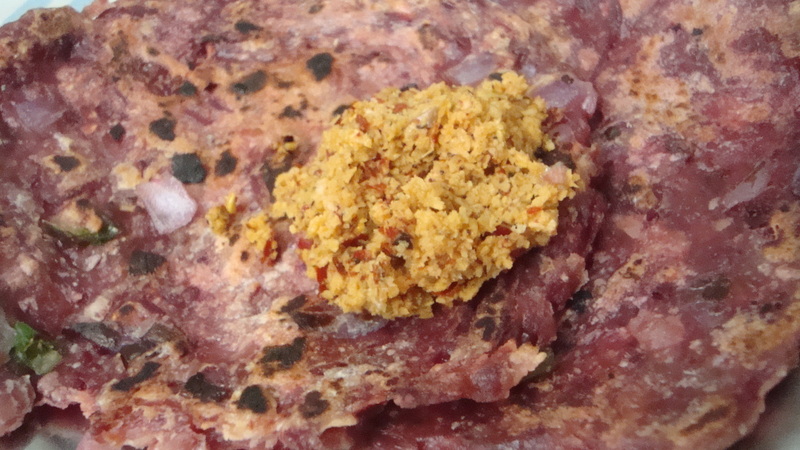 Garlic curry is a specialty of the southern province of Sri Lanka and I hope to soon share the recipe of the dish that I had enjoyed during my several trips along the southern coast. In the meantime, my mother’s experimental cooking has fused her beetroot curry with garlic and has resulted in a quite pleasant, unique curry. Heat a tbsp oil in a pan and fry the garlic and onion for a couple of mins. Add the chopped beetroot to the pan and mix well. Add the coconut milk or water and salt, to taste. Add the curry powder or chopped green chilli to the pan and cook for about 15 mins. When the liquid starts drying up, add the chopped tomato and cook for a further 5 mins.